For all the benefits of technology, there’s nothing that truly replaces the human touch. The campaign begins this week with a new video created by agency Circus Maximus. 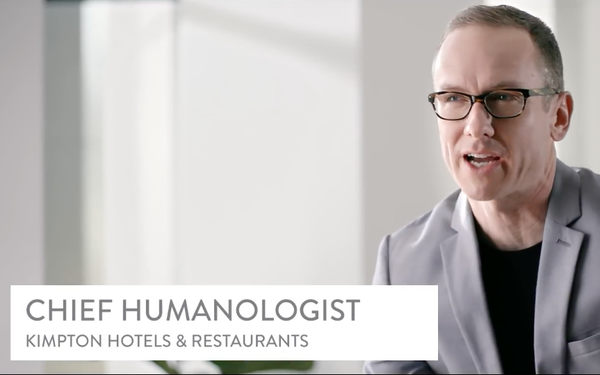 In the new video, the company unveils its “H.U.M.A.N.S” operating system, which features the brand’s “chief humanologist” (not a real title) explaining the brand’s latest technological disruption. “Since our inception, Kimpton has run on a very unique operating system,” he says. “We call it … humans.” The film then moves on to testimonials from Kimpton employees explaining how they can express empathy or literally giving a guest the blazer off her back. “An algorithm can’t do that,” the employee says. Reidenbach notes, however, that the brand isn’t taking an “anti-technology stance.” Technology, she says, helps fuel the online searches and bookings for many Kimpton properties, and lays the groundwork for the connections the brand has with its clients. The “Stay Human” campaign will continue through 2018 with elements involving on-property experiential touchpoints, as well as video and social content, Reidenbach says.